I don’t know about you but when I left school I thought ‘Great I am never going to have to do Maths school work again’ well I didn’t think very hard about that did I. I had 3 kids that all have needed Maths help over the years! We have tried a few things to help kids with Maths over the years, so I thought I would pass on our ideas and things we’ve used. One of my daughters is very active, she hates to sit still for very long and would much prefer to sit with something in her hands to help her sit still! So I found these great mathematical magnet toy, with 6 magnetic discs you can change them all around to create sums. They also have been using items like number cubes, and fraction blocks these are lovely visual items that they can use with their hands. Also number lines are great, I also spotted this great large number line mat that you can use on the floor to jump from! Mine would have loved that when they were just learning about numbers. Making learning fun is a big thing. Schools don’t always have time to teach all the kids something in a fun style. So this is when we can come in. 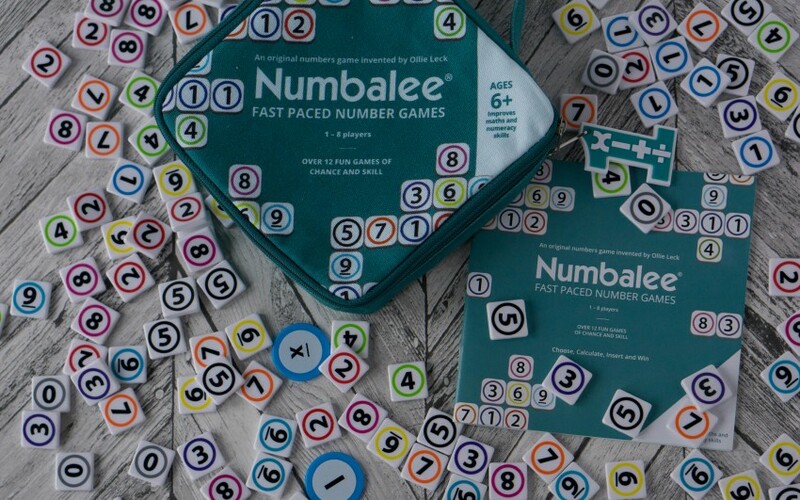 We were sent Numbalee, a brand new tiles based game that all the family can play. It is aimed at 6+, I have a 13 year old son and a set of 8 year old twins, and they all would be suited for this. As well as being able to play it as a family too. I need my Math skills brushed up on! What I loved about this game is how many different games you can play in it, there is 12 games to choose from, which ranges from 1-8 players. The first game we played was basically like scrabble with numbers. It got my kids really thinking about their Maths skills, creating sums and problem solving. It is also packaged in a great little bag, so perfect for travelling too, and priced at Numbalee. Take a look at Numbalee website for more information. I found that my kids absorb information even when they don’t think they are learning. 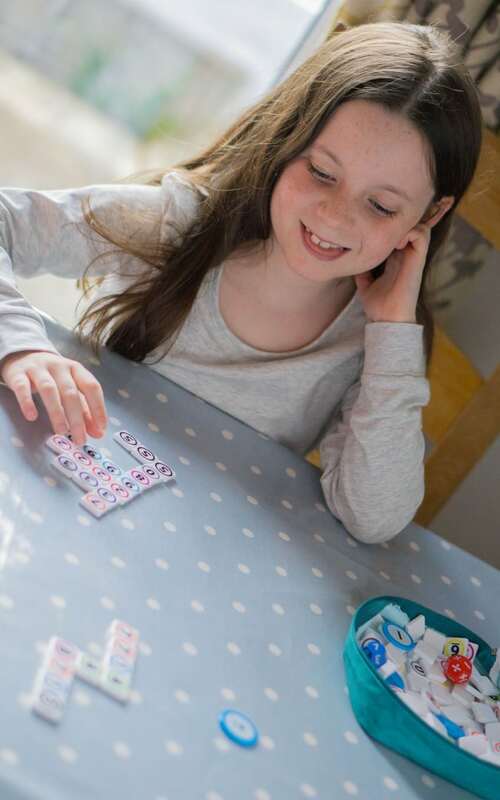 Popping up times table posters or post it notes around the house really helps. On the back of the bathroom door in front of the toilet is a good one! How about signing times tables songs?! I don’t mean those boring ones you had to reel off over and over again when we were kids. MathsRockx is an app that has times tables in pop songs! Songs that the kids know and love. Even the schools now use and suggest we get them to play online math games. MyMaths and Times Tables Rock Starz are suggested ones by our school and my girls love playing them. When I asked Tyler what he likes to use for his Maths practice……..a Brain and a Calculator! So is there anything you love using to help kids with Maths? *Post Contains Affiliate links, which means if you purchase something through my link you won’t pay any extra but I get a small commission for referring you. * We were sent Numbalee for consideration for this post, however all words and opinions are honest and my own. It’s good fun and keeps all of them happy! I will have to check out those songs!!! 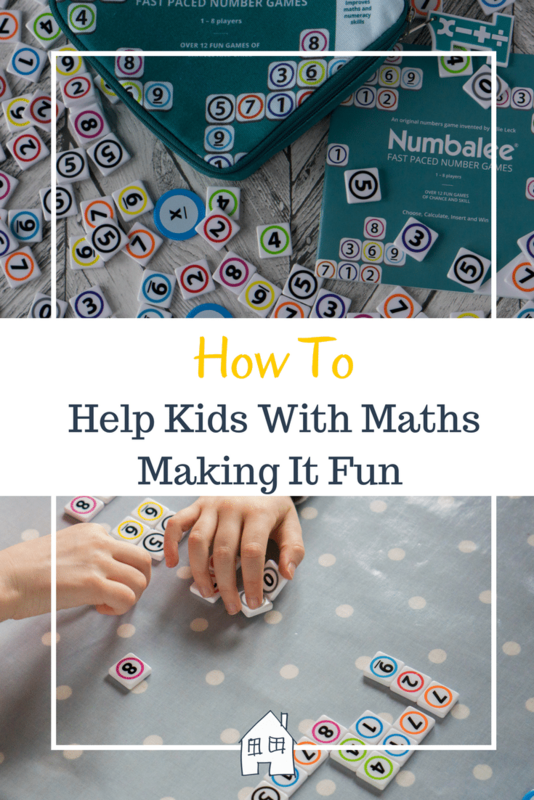 I too hated maths at school so I try and find ways to make maths as fun as possible.I even had to buy a help your child with maths books as my 8 year old had homework that i did in year 9!!! Yes they are making it so much harder now for them aren’t they, it’s scary! I think the key thing to encouraging children to learn is to make it a fun environment for them to do so. Number games are such a good idea, we use number flashcards in lots of different games to help with number recognition. oh this looks so good – I will definitely be adding this to my basket on Amazon! Yes it’s fun to build on their skills, always surprises me how much they know too! I’m with you, I hated maths in school and absolutely dread having to do it with my kids – anything to make that easier has to be a good thing! I also agree that tools to make learning fun and interesting in any way are always appreciated! Glad i’m not alone on this one then!! I’m just starting to really concentrate on maths for my little one so this post has been very helpful. I’m definitely trying to make it fun, that’s what my gran did with me & I loved maths so that’s the approach I’m taking. I’m going to check out numbalee for sure. Thank you, its lovely seeing them learning lots of new things isn’t it. Haha! Yep I had a few cubes to learn my Maths with!! But I’m not that great at it so bring on the fun and games!!! This would be great for my niece and nephew. They will find it so useful. Yes it is good to find something that makes them have a little more interest, if it’s fun and a game mine are happy!! I think that making it fun with such a game is so important. I used to hate maths and I wish I had that when I was a kid! This is exactly what I need right now – my son is 6 and I’m really struggling to make maths fun for him! So I am I but this game was quite fun for me too! 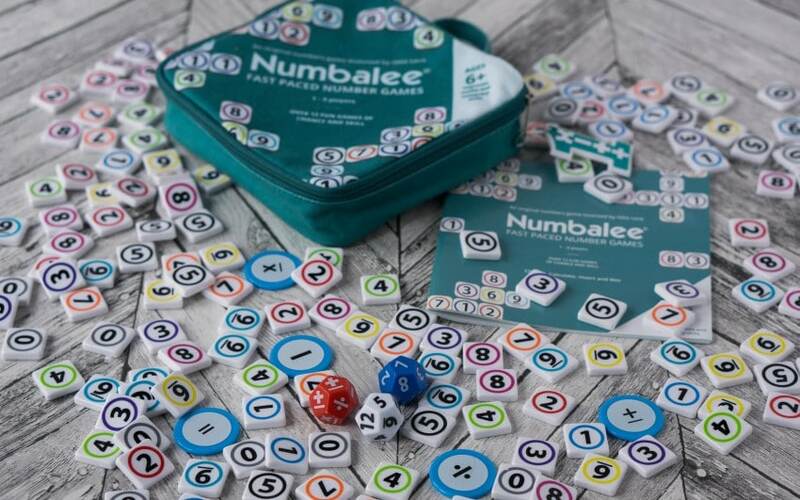 Numbalee looks fab and I’m just being introduced to numbers at school ( I am only 5 after all) we tend to sing a lot at school to help information get absorbed into our brains -it works! Singing is so much fun!! Oh I hated maths with a passion and just never really understood it! I am okay with mental arithmetic but anything else and my brain would be fried! haha Unfortunately, my kids seem to have inherited by maths prowess and they both struggle, too! 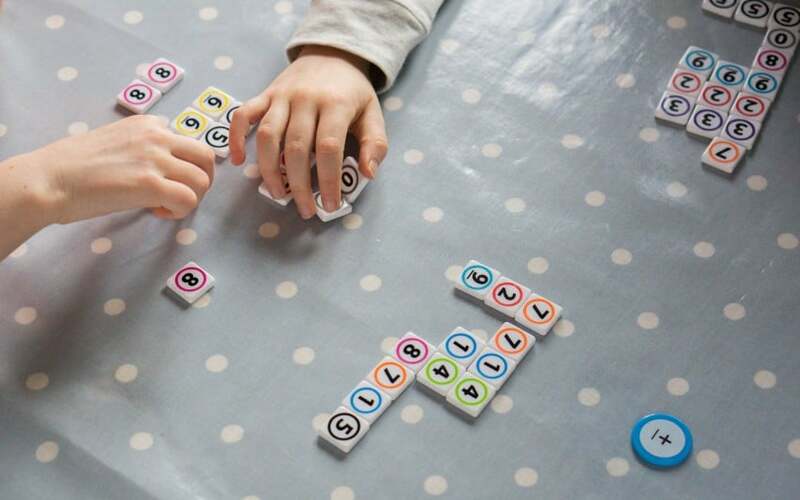 We definitely need a fun game to make boring maths fun and this sounds like the perfect thing! Yes I really struggled too, I hate numbers!!! Hopefully these ideas make it a little more fun! Amazing tips! I am always looking for ways to help my children with their maths! My daughter is only four but is really into numbers…we try to teach them in every day situations especially with things like halving. I love the look of Numbalee! Yes that’s a brilliant way, mine use to love counting up the stairs! These are great ! I honestly never knew that these existed ! My teenager loves math but my youngest not so much . I reckon he would have fun with these. Thanks so much !